Tiny home on Trailer 29'6" x 9'2"
Give in to your wandering spirit and follow your own path. 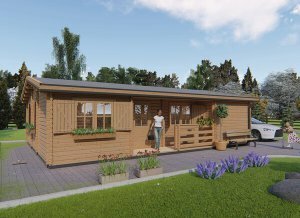 Just remember to take our fabulous trailer cabin with you to do it in style. Heaps of usable space inside for living space, bedroom, bathroom and kitchen all on hand. Fill it up your way with hopes, dreams and soft furnishings. When you need to uproot, you can simply take it with you. The perfect piece for maximizing your freedom. 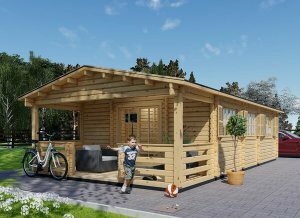 This cabin is so easy to assemble and move whenever it is needed. It gives you masses of internal space and is an impressive 8.5ft x 30ft. The roof and flooring boards are 0.8 inches to protect against even the worst weather. The 2.7 inch thick walls block out noise and maintain the internal ambiance. 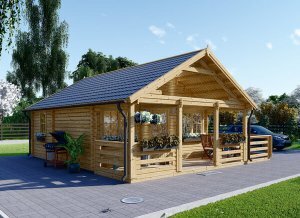 With high quality materials used throughout, you can be fully assured of its quality. External dimensions (width x depth) 29'6" x 9'2"